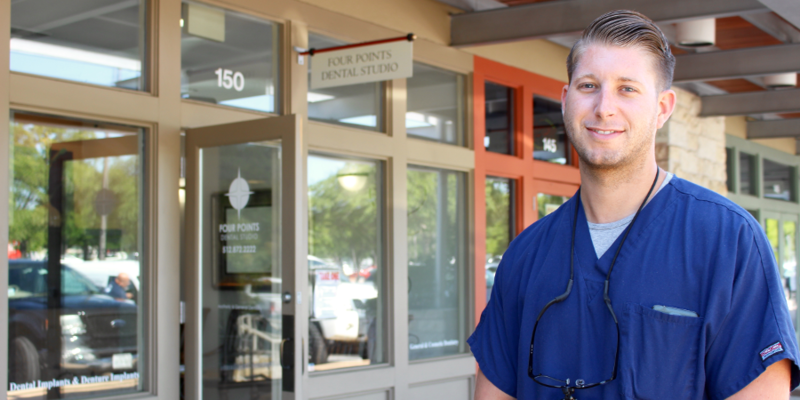 At Four Points Dental Studio, we believe in patient-centered care. Our goal is to develop long lasting relationships with our patients by understanding their desires regarding oral health. We know how tough it can be for patients to make it to the dentist. Therefore, we will do whatever we can to make your visit stress free. We have an excellent team in place to ensure that you are comfortable at your appointment. Regardless of your treatment needs, our goal is to walk you through each procedure step-by-step to ensure that you are comfortable. We have developed excellent methods for dealing with dental anxiety and pain control so that your visit is as pleasant as possible. Dr. Heiman began his education at Stonybrook University as a dual major in Psychology and Chemistry. After completing his undergraduate degree, he continued his education at New York University College of Dentistry. He then went on to receive further training at Queens Hospital, completing a one year dental residency. Dr. Heiman practices all aspects of general and aesthetic dentistry. He has spent time caring for under-served and special needs patients. This includes restoring smiles for substance abuse patients, as well as patients with dental anxiety. This experience has helped him to develop patience and treatment methods to mitigate anxiety. He is a family dentist who enjoys caring for patients of all ages and has special training to ensure excellent care for all of your family members. Whether you are in need of a simple check-up, have a dental emergency or are interested in enhancing your smile, he can help you. Dr. Heiman believes in the importance of understanding the desires of each patient. Through his relationship with you, he will provide education so that you can achieve healthy oral habits at home. When he is not caring for patients, you might find him exercising and playing sports, reading, listening to live music, watching sport events, and spending time with loved ones.